As part of the Christmas spirit, DanceSport Australia is running a Christmas Special for our National DanceSport Championship. 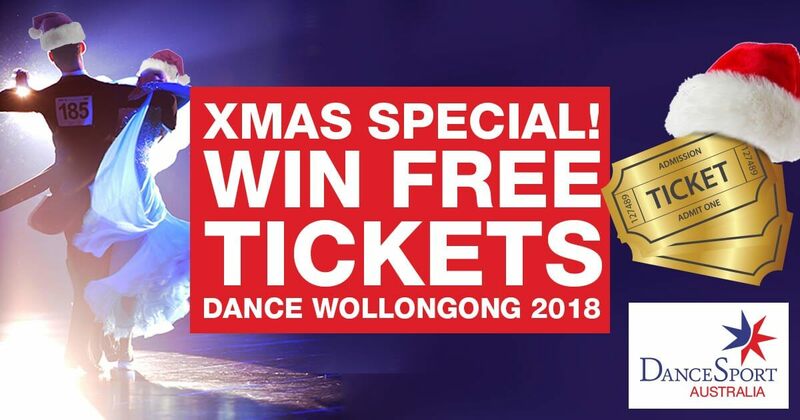 For your chance to win FREE tickets to this great event, just subscribe to our mailing list for 2018 and go in the draw to WIN one of three double passes to DANCE Wollongong. DANCE Wollongong is operated by DanceSport Australia and is one of Australia's most prestigious competitions. Having moved from Canberra only last year, DANCE Wollongong was an immediate success for many reasons. We look forward to dancers coming from all over Australia and overseas to compete at the 2018 National DanceSport Championship. We intend to bring to the floor in 2018 an even bigger array of breathtaking talent. You will need to be there to witness this amazing spectacle. The competition for final placings is expected to be extremely tight, making an exciting night for spectators. DANCE Wollongong is known for its excellent organisation, meticulous attention to detail and, most importantly, making every effort to satisfy the needs of competitors, judges and spectators alike. Everything points to DANCE Wollongong 2018 being even bigger and better. No wonder Wollongong is a popular destination! Subscribe to the DANCE Wollongong mailing list for a chance to win tickets to this great event.